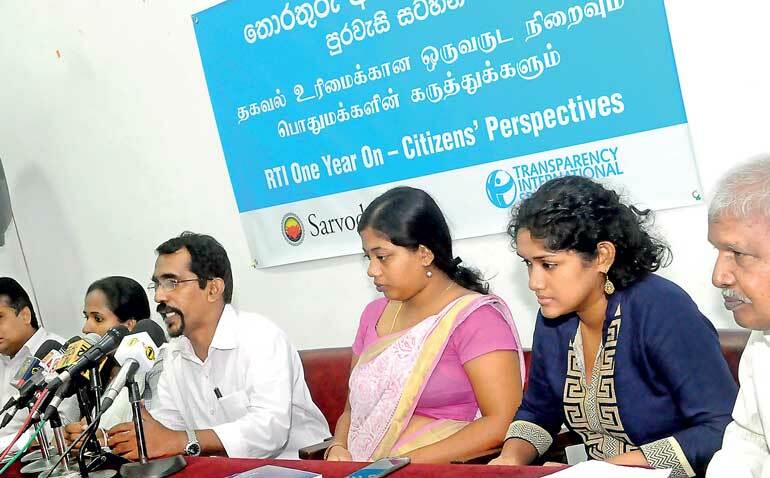 While commending its efforts to enact the Right to Information (RTI) Act, Transparency International Sri Lanka (TISL) called on the Government to raise awareness regarding the act among citizens and ensure the implementation of the Act is carried through effectively. Addressing the media at the Foundation Institute on Friday, TISL RTI Manager Sankhitha Gunaratne said that thus far a majority of RTI requests had been met with positive responses. “We are encouraged by the fact that many State institutions have demonstrated their readiness to disclose the information they posses and would encourage citizens to exercise their Right to Information,” she said, pointing out that 3 February marked one year since the enactment of the RTI Act by Parliament. However, there had been several instances where an RTI request had been rejected, Gunaratne said, referring to an RTI application submitted by the TISL inquiring into whether State resources were used at any of the 2017 May Day rallies. “We submitted two RTIs, one to the Department of Railways and the other to the Sri Lanka Transport Board. The Railway Department provided us with the relevant information but the Transport Board refused our RTI application,” she said, adding that TISL would be appealing the case at the RTI commission. She also noted that an RTI filed by TISL to ascertain whether State resources were used for the celebrations to mark 40 years of Premier Ranil Wickremesinghe being in Parliament received a response to the effect that there wasn’t any information on record pertaining to the event. TISL further warned of a trend of a large number of citizens resorting to the use of RTI as a problem-solving tool due to the failure of public services. TISL RTI Project Assistant – Vavuniya Vinodhini Balasubramaniam said a host of elderly citizens above the age of 50 had been refused land deeds by the Vavuniya Pradeshiya Sabha. Balasubramaniam also mentioned an instance where an RTI application resulted in exposing the substandard construction of a public school in Omanthai. Meanwhile, Thushani Kandilpana from the TISL Matara unit said that a school teacher nearing retirement age, who had already received her pension number and details, was being repeatedly asked by the Matara Pradeshiya Sabha to submit documents to finalise her pension details. TISL has facilitated 610 requests for citizens in 10 districts while the Sarvodaya foundation has facilitated 233 RTIs. The TISL called on the State to raise awareness regarding RTI among citizens, particularly through the State media, and to continue its work sensitising the public sector and its officials on the need for open and participatory governance.